When asked to name a piece of classical Japanese art, the first image that springs to mind for many people is The Great Wave off Kanazawa by Hokusai Katsushika. 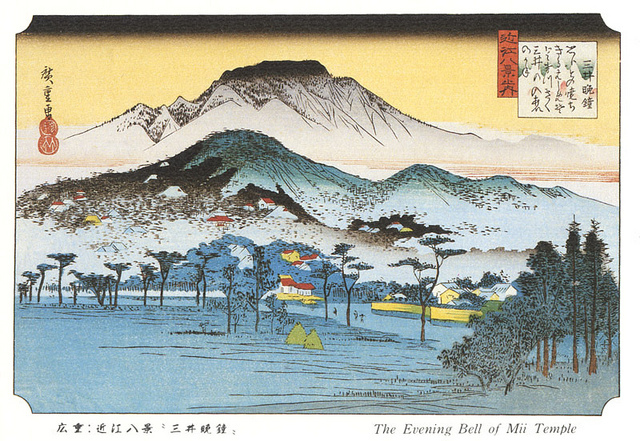 This print, first published in the 1830s, is an example of the precise, colourful wood block prints, or ukiyo-e, for which Japan is justly renowned. Ukiyo-e and its related genres developed over the course of about three hundred years, from the 17th through the 19th centuries. Known for strong lines, beautiful colours, and stylised forms, the prints are one of the earliest forms of mass-produced, commercial artwork. During the form’s heyday, common subjects for compositions were sumo wrestlers, kabuki actors, and beautiful women. By the time of the late Meiji period (around 1900), ukiyo-e had experienced a sharp decline in popularity. Eclipsed first by newer, Western influenced forms, ukiyo-e retreated into journalism, only to be replaced by the emergence of photography. It was during this same period that many original pieces (from which prints were made) were sold or gifted to Western interests. One man, Seizo Ota found this situation unacceptable and began to collect pieces of ukiyo-e and its related forms. Active as a collector for over fifty years, Ota’s collection eventually numbered over 14,000 pieces. After his death, the Ota family opened a small museum dedicated to preserving and promoting ukiyo-e as an important part of Japan’s unique cultural heritage. Today, the Ukiyo-e Ota Memorial Museum of Art sits on a small side street just a few minutes’ walk from the Omotesando exit of JR Harajuku station. Open year round, the museum specialises in themed exhibitions that inform the visitor of all aspects of ukiyo-e, from the teams of artists who produced them, to the wealthy middle class who collected them. Often these exhibitions center around figures in ukiyo-e such as “sumo-e”, prints about sumo wrestlers and their lifestyle, or “yokai-e”, a collection of prints depicting monsters, ghosts, and devils. Other exhibitions are focused on famous ukiyo-e artists (the museum held a special exhibition this year for the 100th anniversary of the death of Kobayashi Kyochika) and around the production and preservation of ukiyo-e prints. Finding the museum is easy. Take the Omotesando-guchi (Omotesando Exit) from JR Harajuku Station. Walk to the corner of Omotesando Street and head away from the park. The museum is on a small side street about a five minute walk from the corner. If you see the entrance to the Chiyoda Subway, you’ve gone too far. Once you turn on the side street, you’ll see a sign for the museum. It only takes an hour or two to see everything the museum has on offer at any given time, but it will always be an hour or two well spent! From JR Yamanote Line “Harajuku” Station: Take Omotesandoguchi Exit and go down Omotesando St. to Meiji St. for few minutes. Make a left turn just past the Softbank cellphone store. You will see the sign at the corner. From Chiyoda and Fukutoshin Subway Line “Meiji Jingu mae”: Station:Take #5 Exit and go straight Omotesando St. Make a right turn just before the Softbank cellphone store. You will see the sign at the corner. One man, Seizo Ota found this situation unacceptable and began to collect pieces of ukiyo-e and its related forms. Active as a collector for over fifty years, Ota’s collection eventually numbered over 14,000 pieces.